This gorgeous Georgian Bay waterfront log home boasts a stone fireplace, a private hot tub under the stars with gorgeous view of Georgian Bay, two bedrooms, including a Georgian Bay View. 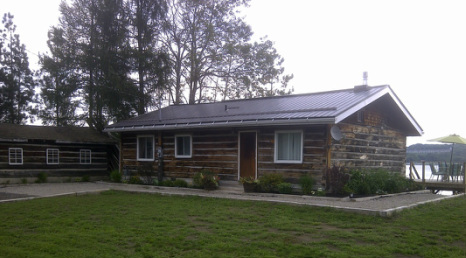 Located just 1.5 hours from Toronto and just 2 minutes outside downtown Penetanguishene. The Ontario Cottage for rent has a boat and motor, canoes, huge sheltered deck with heaters, outdoor audio entertainment system, enormous Dock that handles up to a 30 foot vessel (bring your boat), a sandy beach and easy access to dozens of local attractions. There’s nothing cozier than lazing around in a cottage by a lake on a rainy day and there is much to do indoors if needed. The beautifully furnished living room comes with two large sectional couches and 60” Plasma HDTV, Blue Ray/DVD with satellite. We offer two Poker tables on request. Pull out the board games, check out our DVD and video game collection or PVR’d movies. See what’s on the satellite, surf the internet, read that t novel, and take in the country air – smell the trees, flowers, cottage cedar and enjoy the beautiful fire place. There is a spacious open kitchen includes a fridge, stove, microwave, toaster, coffee maker, blender and dishwasher. A unique dining area with a reclaimed wood harvest table which seats 8 and there are Three bar stools at the kitchen counter for the kids. In the Master bedroom there is another television (50” Plasma) a queen bed (always with clean fresh linens) and a Georgian Bay view window. The second bedroom has another queen sized bed and a linen closet for extra pillows, blankets and towels. This room has its own en suit bathroom and a 32 inch TV, DVD player and video games for the young and young at hart. Conveniently located just outside of the town of Penetanguishene. A five minute drive to the LCBO, The Beer Store, grocery store, pharmacy, local restaurants and shops. Minutes from the cottage is Penetanguishene Harbour, where the Georgian Queen sails twice a day on guided tours into the 30,000 islands on Georgian Bay.